On Pinterest, we have both Board and Account following and people can choose to simply follow your account or just follow one or more of your boards. Boards are like your account segments and each board is further broken into Sections. Your home feed (Smart Feed) shows Pins from people and boards that you follow, plus Pins inspired by your boards and recent activity. But is it that important to care about your number of followers? It’s two months today I have been pinning more consistently. I have created pins for some old evergreen posts and seen them breathe more healthily. I do create pins for new posts as well and have read a bunch of Pinterest tips posts. I believe I’m now better at the game. But a lot is still to be discovered. Consistency has grown my follower base from 957 last month to 1.9k today, in just a month. Now, if you are reading and trying to improve your pin performance, these are the core areas discussed in most of the articles out there. But are they all important? Which of these deserve more of your attention? Well, I won’t get into details of all these parts. Let’s focus on your followers now. Like any other social media platform, your followers on Pinterest are members who can easily find your pins, generally on their Smart Feed. The Smart Feed is the Pinterest Home Page once you are logged in. The content differs from pinner to pinner, depending on their interest and those they follow. So one may think that the more your followers, the more your exposure and traffic. All things being equal, that reasoning is correct. Pinterest is shifting from being a social network. That means a lot if you want to see success on Pinterest. Shifting away from being a social platform means Pinterest is turning resources to something else called Visual search engine! So if Pinterest is giving importance to its search capacity, is it still important to lay emphasis on followers? What is the relationship between Search and Following ? Let me share with you what I discovered. I haven’t read this from Pinterest blog or from somewhere. You may have a better explanation or maybe have a document somewhere with clearer notes. The entries on this result page were from folks I follow on the platform. As I scrolled further, I began seeing results from people I do not follow. Again, the first four lines on the result page were all Pinners I follow. From the fifth page, I started seeing folks I do not follow. I did same with the “Boards” option and the results were same. This brings me to the conclusion that Pinterest followers are still important. The keyword I used is actually one of my niche keywords. So definitely, most of the people I follow have optimized their profiles and boards for that keyword. That should explain why content was pulled from my following. As expected, I had tons of entries on the result page but not of them was from my followers. The more followers you get, the more Pinterest SEO works for you. People who follow you are more likely to search for something you’ve shared on the platform. Therefore, if you want your pins to rank on top of Pinterest SERP for more searches, you’ll have to get more relevant followers. We’ve seen from the simple discovery above that the accounts and boards you follow are a ranking factor. Despite the keyword optimization, (for the most part) Pinterest algorithm will have to first of all tap into your following each time you run a search to get the best results before spreading across other boards and accounts. While you get traffic from your followers’ Smart Feed, you also draw traffic from their search result pages. More followers, more re-pins, more traffic. 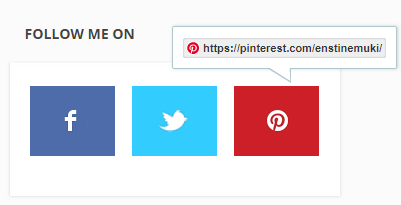 Pinterest has the re-pin (Save) feature which is like Share on Facebook and Retweet on Twitter. This allows your followers and others who find your pins through search to save your pins in their own boards. Added to the Save button is the Send command which allows people to send your pins to others on the same platform. But this seems to be the most underutilized feature on the platform. While I have never received a pin, those I have sent out have not had any feedback. Now we’ve established that getting followed on Pinterest is important for exposure and traffic. But how do you attract more followers? This is some seriously rocking information! I often get started on Pinterest, but that’s as far as I get with that program. It is pretty easy mostly, but for some reason I haven’t used it as much as the others. Obviously, Enstine, I need to use it more! Yes I think you should use the platform more. Though constantly creating shareable pins isn’t bread and butter, the results are worth the effort. Never tried Pinterest because I been focusing on facebook ads but I am on way to try it. Thanks for sharing! Pinterest is more for traffic and people get way more results for free. Good to know Enstine. Pinterest really is turning into THE visual search engine as those user numbers grow. Super high engagement levels over there too. Win-win, I say. I always love to read new discoveries about Pinterest. Yes I completely agree, Pinterest followers are still relevant today. Thanks for the feedback. The platform is exciting and constantly changing as well. I like using Pinterest for my business and as a business owner I love having a lot of Pinterest followers. Thank you for the great post. Hi Enstine, Thanks for sharing your Pinterest experience with us here. I wasn’t sure of the answer. I’ve upped my game this year and have seen traffic start to pick up from it. It’s mostly from using Tailwind and Viral Content Bee. I’d love to know how to get more Tailwind tribe members to my tribe. It seems you have to invite via FB or email only? I’ve pinned your cute duck image for this one Enstine. Thanks again and have a great day! PS Love to have you do a guest post about Pinterest at my place if you are interested. First, thanks for pinning this post. I do really appreciate. You can’t be consistent on Pinterest, crafting great pins and not see results. I have no doubt you will see even better results. Now about your Tailwind question, I’m still to get to that tool. I still can’t confidently answer any question on it now. But if I find something, I’ll definitely share with you. This is indeed an interesting discovery. I just claimed my url less than an hour ago on Pinterest. And hope to push more to have the SEO benefits. Thank you bro. Great you’ve taken an important step. If you can, invest in a course so as to avoid errors and get results in time. Noted. Thanks for your response. Really appreciate it. I love Pinterest. Over the years I have seen a constant increase in traffic, with followers and yes those pages that struggle to rank on Google they are doing very well on Pinterest, so it does create a balance. So I would definitely recommend investing more time in Pinterest to boost content-based marketing strategy. Great post, thanks for sharing, Enstine! Wow that’s sweet to hear Michela. I just searched, found and followed you now. Yes that platform should do well for travel bloggers. A little more effort, you will see even greater results. Thanks for this valuable information, yes, Pinterest is important and of course the followers too. I am already following you and I pinned most of your posts too. It is really good to know more in this regard. I am going to act accordingly. Hope this will take us to a different higher level. Appreciate your posts notifications and follow-ups. Have a great time of sharing and caring ahead. thanks for the feedback and for following and pinning. Good to hear from you again, thanks for the quick response to my feedback. I would like to raise a question to you in this regard, in one of the tips you pointed out: Share your Pinterest account URL on your blog. Good, that is a good idea, but, Enstine, how can I embed this on my site like the one I installed (Facebook) on my website sidebar. How can I embed Pinterest and Twitter on my websites, is there any plugin for this purpose. I have a confusion that to get more followers, I need to repin their images so don’t you think my own pins will be lost in those pins, how you manage or how you standout your pins for clicks. Pinterest does not limit the number of pins you do. Some people pin 30 to 50 a day so if you do 80% of yours and 20% of others, yours won’t get lost. Note that the ratio doesn’t matter though. I have been paying much attention to my Pinterest profile since past few days. I won’t say that I am getting a lot of traffic, but I have increased my followers and number of monthly views. Hoping to get better numbers soon. Pinterest is another great traffic source. I will never joke with it. I started using it recently and it’s making sense. Pinterest followers are key to long term success. The more relevant followers you have the more people will find you and connect with you. And Pinterest marketing is both a short and a long term game. Anyway, your reports on your Pinterest achievements really inspire me, and I can’t wait to become more active there. The only thing stopping me is that I don’t want to spread myself too thin. I was just going to leave and then I saw this post and yes it’s really time Worthing, I was literally shocked about the power of Pinterest followers. And it is also very true that it’s very effective for long term business. Thanks for another well written and thought provoking post. Pinterest is certainly an enigma but here’s the bottom line: it’s a traffic generating powerhouse. And because of that, I want to understand it. I want to know it inside out. And thanks to your amazing post l now have a bit more insight. You can’t be wrong paying attention to Pinterest. Be consistent and you’ll see results.